Every year growing up I'd look forward to the fresh ham sandwiches that came after a holiday meal. I went through a phase where the ham had to be cut into small chunks so that my little teeth could get through the meat and every bite had a bit of ham goodness in it. My dad always lovingly obliged my finicky demands. I have many memories of the two of us in the morning assembling the masterpiece of a sandwich that would be my lunch. I'd tell him exactly how I liked it and he would help me bring my creation to life. I seriously have the best dad in the world. Last year, my Uncle blew my mind with an idea for leftover ham from our Easter dinner… HAM SALAD. I've had egg salad, I've had tuna salad sandwiches, but I had never thought to do the same with ham! Maybe you've heard of this before? I hadn't and the thought never even crossed my mind. In case you're like me, I felt it was my duty to share the idea of ham salad with you. This is an easily adaptable recipe and I have a few improv suggestions below that you should check out. 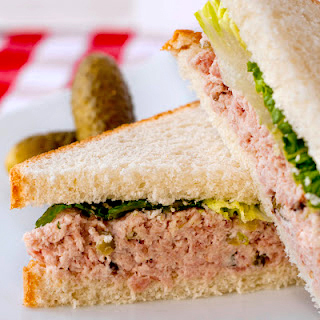 If you have leftover ham from Easter, definitely do yourself the favor and make this sandwich for lunch this week! In a bowl, combine shredded ham, mayo, and dill relish. Stir until combined. 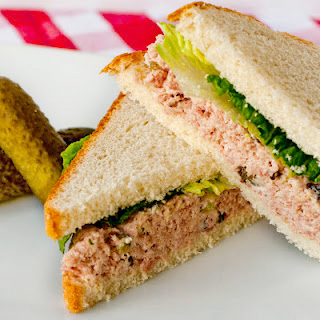 Place half the mixture onto a slice of bread, add a leaf of lettuce, cover with other slice of bread. Repeat for the other 2 slices. I think this recipe begs for good old fashioned, chewy white bread. Health nuts everywhere are cringing in their seats, sorry! you can use your favorite type of bread (whole wheat, an artisan loaf, etc…). heck, if you're doing the whole passover unleavened bread thing but you're still down with pork, put it on a matzo! mmmmm... this is also great as a snack on crackers. not a pickle fan? leave it out. my uncle does sweet pickle relish. i'm not down with the sweet pickles but if that's your thing, use that instead! you could add your favorite sandwich toppings but i like to keep it simple and let the ham shine!